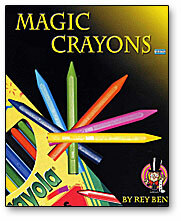 Magically produce crayons from your bare hands! The performer shows both his hands to be completely empty and then produces six crayons one at a time, without his hands ever going near his body! To finish the routine, the performer reaches into the air and produces the crayon box. Finishes completely clean!